This is the evolution of CT_RaidTracker used by and maintained for the Guild Launch Rapid Raid DKP System for WoW. This mod provides dead simple tracking of raids, item drops and user defined events such as Attendance, On-Time and other DKP awards. 8.1.1 - Updated to properly track Alliance bosses and Jaina. 8.0.4 - Fix for import string. 8.0.3 - Update to fix MOTHER tracking. Also fixed the delete item button, the icon was lost in a previous update. 8.0.2 - Update to fix Zul, Reborn tracking. 8.0.1 - Updated for BFA. There may still be unknown bugs lurking. Please post on the GamerLaunch forums if you notice anything! 7.3.1 - Updated to properly track Antoran High Command, Eonar, The Life-Binder and The Coven of Shivarra. 7.3 - Updated for 7.3+ and Argus raid added. A few bosses are in question of how to track. Will update if necessary. 7.2.51 - Fix for tracking The Desolate Host. 7.2.5 - Update for ToS bosses. Will test this week. 7.1.5 - Update to fix boss tracking on Grand Magistrix Elisande and High Botanist Tal'arn. 7.1.1 - Update to fix Trials of Valor tracking. 7.0.34 - Fixed /rt io issue that was not ignoring the items you set to ignore. 7.0.33 - Fixed boss tracking on Elerethe Renferal. Fixed item tooltip hovers in item listing. Fixed an issue on /rt io for quest items like Essence of Clarity. This should be everything until Nighthold releases. 7.0.32 - Fixed boss tracking on Dragons of Nightmare and Il'gynoth. Fixed spacing on attendance list. Fixed item icons in item listing. Now tested on Nythendra, Dragons, Ursoc and Il'gynoth. Should be testing Elerethe Renferal, Cenarius and Xavius tonight! 7.0.31 - No longer tracking Broken Isles World Bosses. I thought it was a raid, woops. 7.0.3 - Updated to work with Legion Pre-Patch on Live. May have errors on Legion Beta Client due to special debug mode engaged by Blizzard. 6.41 - Actual fix for Hellfire High Council, because I missed an underscore. 6.40 - Fix for tracking Hellfire Citadel - Hellfire High Council. 6.39 - Update to fix lua error from scrolling in /rt io. 6.38 - Update to fix boss tracking for Kormrok, Kilrogg and hopefully Hellfire High Council as well. 6.37 - Update for 6.2. Should also fix looting lua error. 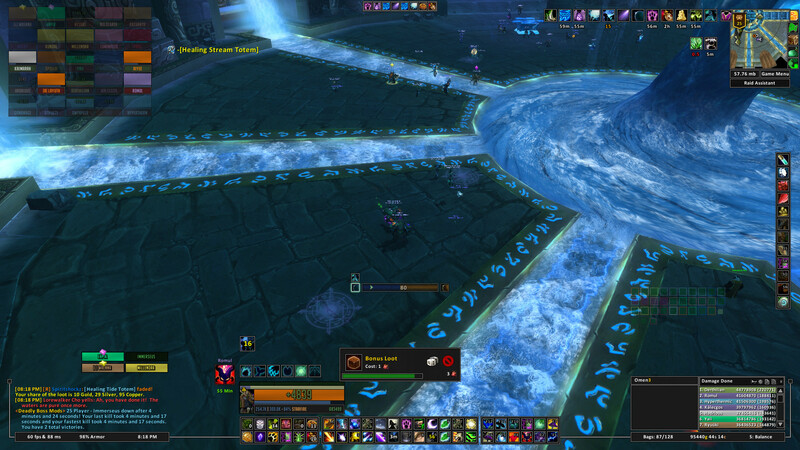 Some Hellfire Citadel bosses may not track. I will be actively testing this as my guild progresses. Please send any bug reports to [email protected] or drop a note on the support forums! 6.36 - Hotfix for converting from raid to party lua error. 6.35 - Fixed an issue where it was adding Unknown-Server as a member of the raid. Fixed lua error resulting from converting from Raid to Party. Lastly made the join/leave recording more accurate. 6.34 - Update to fix missing pop up DKP cost window. 6.33 - Updated Import Version to inform of compatibility issues. 6.32 - Update for DKPmon Logging Mode green icons bug! (If you do not use DKPmon and or Bidder, this is an unnecessary update). 6.30 - Standardized naming across all 3 addons (CT_Raid, DKPmon, and Bidder) to prevent naming hiccups. Non-native server characters will be Name-Server, native server characters are just Name. Also includes a few more little bug fixes. 6.29 - Loot tracking fix and some Italian localization(more to come). Loot tracking was indeed broken as a result of the Auto Boss Cooldown Time setting. It was still thinking seconds, not minutes, so it was being set to anywhere from 1-20 seconds, not 1-20 minutes. My fault! Just being a noob over here. 6.28 - Few more bug fixes! 6.26 - Updated for Patch 6.1. Also added an on/off toggle for Bonus Loot Tracking in the Item Tab of Options (Default = Off). 6.25 - Fixed the edit EPGP costs error. 6.24 - Surprise! I added bonus loot tracking! 6.23 - Fixed the Auto Boss Cooldown Time slider issue. Also fixed The Furnace boss tracking. 6.22 - Fixed all the sliders (Hopefully testing Furnace, Maidens, and Blackhand tonight. Depending on raid turnout/how awesome we are). 6.21 - Fixed a bug with DKPmon Logging. So far tested Gruul, Darmac, Thogar, Hans and Franz, and Ka'graz. Ka'graz doesn't seem to track correctly (working on this), all the others do. Will report back more once we've downed them. 6.20 - Fixed the ask for cost bug. Double checked all defaults and they should be correct. 6.19 - A couple more settings fixes. Tested on Heroic Gruul successfully last night, will be testing more Thursday. 6.18 - Fixed Item Options (/rt io). Also added name-server for non native server members. This may cause these members to not import correctly on GL, this is currently being worked on. 6.17 - Loot and Boss kills should now track correctly. 6.16 - Version number fix, one of these days I'll remember the first time! 6.15 - Various fixes for loot tracking and version number fix. 6.1 - Various fixes for tracking boss deaths and loot in Highmaul. 6.0 - BETA 6.0.3 Support - Bosses have yet to be tested. Normal/Heroic opens Dec 2nd, LFR and Mythic Dec 9th. 3.0.9 - Expected fix for Paragons of Klaxxi! 2.9.5 - Fix for Stone Guard boss detection. Please let us know if bosses are not being detected. I believe that Mogu'Shan has a boss with a yell also, but I have not been able to test this boss yet. 2.9.4b - Fixed upload for proper file. 2.9.4 - Fixes auto creation of a new raid to track when creating a raid group. Also fixes some issues related to people leaving the raid. 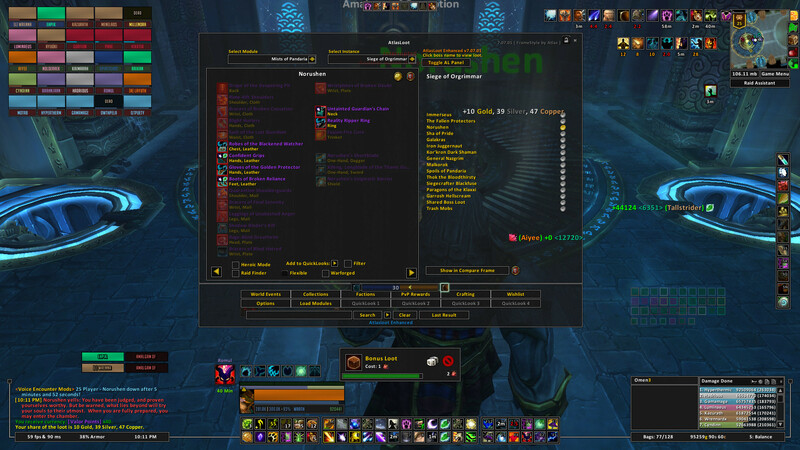 2.9.3 - Fixes Tracking for Mogu'shan Vaults and the Auto Zone triggers. Note: The Auto Create option works only after you have created your first Raid. So, if you start tracking one raid, then switch to a different instance, the first raid will be stopped and a new one created. It does not create a raid if you don't already have one started. Enabling the 'Start Tracking when Joining a Raid' option will typically make these to options play nicely together and make the mod pretty hands off. 2.9.2 - Fix for tracking of groups. 2.9.1 - Fixes Issues With Errors When Looting. as the new exansion has been here for a long time allready, when can we expect the addons to be updated? I became a paying member to be able to use all rapid raid functions and now we just cant really. I will try to screenshot every kill I get just in case. Thanks. Seems like 4 fights are not being tracked correctly. Immerseus, Norushen, Dark Shaman and Paragons. I got a screenshot of Immerseus, Norushen and Dark Shaman. Will work on getting Paragons. Last edited by Layuth : 10-03-13 at 01:28 PM. Any idea when update for 5.4 will be available for download? As always, great job on the addon. It is now available. There may be an issue, and we welcome any feedback about Yells or death order of mobs, about exactly how to track Spoils of Pandaria, but the other fights should work well. Addons developed by/for Guild Launch. Our addons focus on guild management needs such as DKP, Raid Management and Character Profiles. Version 2.11.0 is giving me errors. 1x GuildLaunchCT_RaidTracker-v2.11.0\LibItemUtils-1.0-0.lua:18: Cannot find a library instance of "LibDeformat-3.0". Any plans to update for 5.2? Can you tell me what else is importing as trash? I'm looking into the WotE detection. It appears to be set up properly. With the spirit kings in mogu'shun vaults, it seems like even when the boss dies its still recording it as trash loot. Will of the Emperor is still importing as Trash Mob. Other various items are importing as trash even though the boss kill is importing (noticeably in ToES). Updates have been posted for Mogu'shan, Heart of Fear and Terrace of Endless Spring. I will have updates for Mogu'shan, Terrace of Endless Springs and Heart of Fear after the servers come back up today. Awesome, I should be able to get those fixed up using those yells. While I await the update for the end of Mogu'shan Vaults here is the message from the second boss in Heart of Fear. I missed the first one and will try to get it during LFR this week. Which bosses have you downed so far? I think I have the first boss figured out and will have an update tomorrow for it, but want to check the others. Some of the fights that are not standard single target fights always cause some initial issues until we figure out yells or the exact name of the thing that "dies". The Stone Guard, Feng, Gara'jal and Elegon imported fine. So the ones that need fixed are The Spirit Kings and Will of the Emperor. [11:51 PM] Lorewalker Cho says: It is done, then. Yet...how many of these machines are hidden beneath the earth? How much do we not know about the dark secrets of the mogu? [11:51 PM] Lorewalker Cho says: I fear that our war against our ancient enemies is still far from over. Last edited by Layuth : 10-26-12 at 09:45 PM.